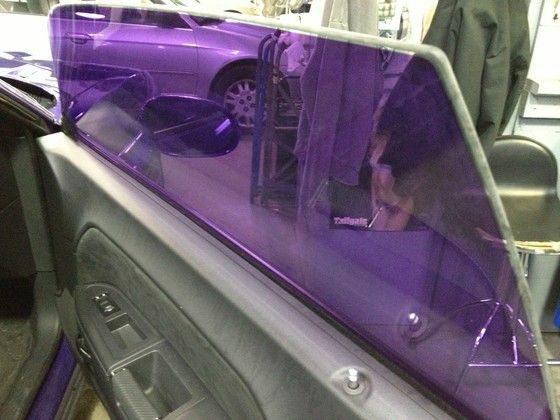 Colorado Tinting offers premier car window tinting Denver can count on. We also proudly offer clear bra installation in three different packages. Window films have come a long way over the years. Window tinting used to be for looks and privacy. Window tinting now gives you UV protection and heat rejection. This means your skin is protected as well as your car’s interior. With the introduction of ceramic films, you now get a significant amount of heat rejection without having a dark film. Ceramic films are the latest film technology. They offer the best heat rejection and absorption out of any films. Colorado Tinting is proud to offer premier car window tinting Denver residents can trust to withstand the test of time. We stand by our product and look forward to serving you. In this photo you can see how damaging the UV rays are. In the U.S. the majority of skin cancer is on the left side which has more exposure. All of our window films block 99.9% UVA and UVB rays. The UV coating not only protects your skin, it protects your children, your pets, and your cars interior by blocking dangerous and damaging ultra violet rays. It also helps your eyes by reducing glare. Because Colorado is at a higher elevation, we are more susceptible to these damaging rays. Being higher in elevation also means there is less atmosphere to help shield us from the rays. Because window tint reduces the heat in your vehicle it is not necessary to run your air-conditioning as much which will save gas and money. Not to mention it is just more comfortable. Privacy is a benefit is well. It is nice not to be in a fishbowl where the world can see you. Choosing film can often be a little confusing especially if you are new to the world of automotive film. Window film is measured in percentages. The lower the percent, the darker the film. The higher the percentage the lighter the film is. The percentage is the amount of visible light that is entering the vehicle. For example 5% (limo tint) is a very dark film because it is only allows 5% of the visible light through it. Most crossovers, S.U.V’s, and trucks have factory tint on the back that are either 20% or 15%. So what film is best for you? Well that is a personal choice. Everyone gets window tint for different reasons. What brand of film should you get? There are a lot of good films out there and a lot of bad films. Our best advice is to do some research. This can be done with google search. Often forums are a good place to start to get other consumer testimonies or opinions. Good window film manufactures offer a lifetime warranty against bubbling, peeling, fading and turning purple. Choosing the film is only half the battle. Just as important as the film, the installation process is just as important. Make sure you find a reputable shop that you feel comfortable with. As of now there are three main types of films. There are standard films, metallic films and ceramic films. As far as looks they are pretty similar, the metallic film is the only film that appears more reflective. Metallic films have great heat rejection, however we do not cary metallic films for a few reasons. Metallic films tend to interfere with cell phone signals, radios, garage door openers and other electronics. Which one is best for you? In all states you can go as dark as you want on your back windows. Each state has its own laws on how dark you can go on your driver and passenger front windows which can be found with a simple Google search. In Colorado the darkest you can go on your driver and passenger windows is 30%. We receive the film in rolls from our manufacturer. The film is then cut by hand cut on the outside of the car, or it is plotted on a plotter (computer cut). The plotter is run on a computer that is updated daily with patterns for every car and are always being perfected. Most people nowadays want plotted windows, but note that there are some applications where hand cutting is a better method. A good installer should be proficient with both methods. Once the film is cut out it is then placed on the outside of the windows and shrunk to size. The film is flat, and most windows are curved, and this is why they are shrunk to fit each individual window. Once the film is fitted, the inside of the window is cleaned and the liner is peeled off of the film and installed on the inside of the window. The film is installed with water and either dish soap, baby shampoo, or film on. These liquids will not harm or damage your interior, and are necessary for install. The window is then squeegeed out. What makes us different? We use quality materials and do a quality install. People often ask why is there such a price difference between tinting companies. There are two main factors that determine a good tint vs a bad tint job. One is the quality of the film, and the second is the install itself. If you do not use a quality film it will fail. It does not matter how good your material is if the install is bad. These two factors determine the cost of the install. There are many films and manufactures to choose from. Some are expensive and some are cheap. We only use quality materials and installers. We warranty all of the materials and installs for the lifetime of the vehicle. Bubbling is a common tint failure. Window films are made of different plus. With cheap film the heat and UV rays cause the plus to separate. This can cause poor visibility. This Film has gaps and multiple pieces that are overlapped. This is an eye sore as well as a visibility issue. This is also a really common window film failure. This is due to the UV rays breaking down the dye in the material which caused it to look purple. Quality films use stable colors that will not break down like this. Fading is another common tint failure. As you can see the top line of the glass is black and the rest is kind of a greenish color. The top line still has the original color because it is tucked up into the seal and is not exposed the UV rays. This car was less than a year old and was already faded. Once your film is installed, you will need leave your windows rolled up for 2-3 days, and maybe longer depending on the temperature. You may have some moisture, water bubbles, distortion or haziness in your film for about one to two weeks after the install. It is best if you do not touch any of the bubbles as they will evaporate in one to two weeks. If you have any issues after two weeks please contact us. You may wash the outside of your car immediately if desired as the tint is on the inside of the vehicle. Do not clean the inside of your windows for a minimum two weeks. You can clean the inside of your windows with a microfiber cloth and your choice of dish soap and water or any window cleaner that does not contain ammonia. The ammonia will break down the film over time.